July 2011 - C Squared (C²) based in Worcestershire, England, which specializes in the manufacture of intelligent room sensors for the HVAC market, announced that their range of Intelligent BACnet Sensors is compatible with the Contemporary Controls BAS Router. 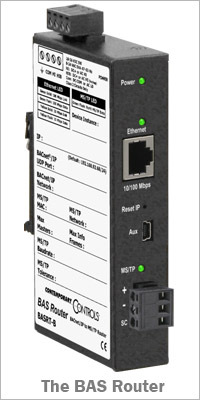 The BAS Router provides a low-cost solution for attaching a BACnet/IP network to BACnet MS/TP. C² recommends using the Intelligent BACnet Sensors with the BAS Router to interface with other manufacturers equipment such as the TREND IQ3xcite range of controllers over BACnet/IP. C² Intelligent BACnet Sensors use BACnet MS/TP. The TREND IQ3 controller uses BACnet/IP. The BAS Router provides stand-alone routing between BACnet/IP and BACnet MS/TP, which, according to the C² website, allows "the system integrator to mix BACnet network technologies within a single BACnet internetwork via the SET programming tool." The C² Intelligent BACnet Sensors are designed to meet the HVAC control requirements of modern building systems that communicate using the open source BACnet protocol. Contemporary Controls has been supporting building automation OEMs' products for years by addressing the unique needs of this industry. The industry is embracing Ethernet connectivity to Direct Digital Controllers (DDC) along with open protocols such as BACnet, Modbus and Sedona Framework. The BAS Router is a multi-network router that allows three-way routing between BACnet/IP, BACnet Ethernet and BACnet MS/TP – thereby allowing the system integrator to mix BACnet network technologies within a single BACnet internetwork. There are two physical communication ports on the BAS Router. One is a 10/100 Mbps Ethernet port and the other an isolated MS/TP port. Configuration is accomplished via a web page. Visit the BAS Router product page to learn more.